Develop, market, and implement Nokia, Blackberry, Android, WindowsMobile7 and iPhone Mobile Applications as well as a Mobile formatted website that will be hosted on blastapps.mobi platform in order to maximize marketing and exposure via partnerships already established by Blastapplications.The mobile website can reach nearly five times as many people per dollar invested than a native mobile app. 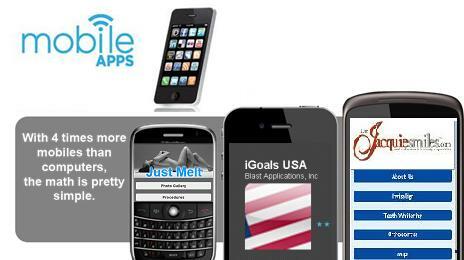 Our strategy is to Create a Mobile website App first and from there create the mobile apps. Provide your company with exposure via Android, Nokia, Blackberry and Verizon in the U.S., as well as provide exposure throughout Europe, Russia and South America via Qualcomm.com Plaza Tim Brazil, Getjar.com, Handster.com and Mobile8.com as approved Mobile Developers and Partners. Qualcomm.com Plaza Tim Brazil is a major mobile application carrier of the South American App market, Getjar.com, a mobile phone applications provider, has a large multi-million subscriber base which generates over 3 million mobile application downloads per day. Handster.com and MTS are major Android app store companies which launched Android App stores in 2011. Partnering with MTS and Handster.com has given us a significant ground floor opportunity in cornering the mobile app markets in those areas of the world, because of the large subscriber base of over 100 million customers in Russia and Europe. Blast Applications will see all the Apps through the approval process and will follow up with marketing each App to reach the most downloads, We are looking for a long relationship between us and totally satisfied clients. Real Exposure for your Business, Product or Service? We offer everything from Website Design, Mobile Website/App Development, to Web Controls and Widgets for your existing site. We are your one stop source for all your needs when it comes to Internet Marketing, Consumer Retention and Development, as well as the latest in Mobile Website and Application solutions. It’s about building relationships. To engage customers or enable employees, businesses must be able to expose core functionality to the right people and on the right devices. Consumer-facing mobile products must be rich and engaging, while internal corporate apps must be secure and efficient. 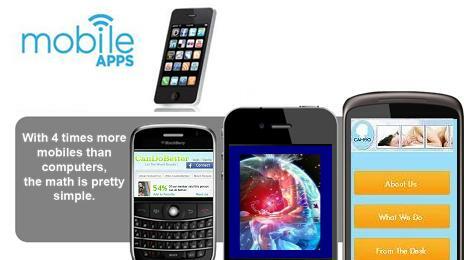 Whether through iPhone, WindowsMobile7, Blackberry, Nokia, or any of the other top platforms, we provide top rated Mobile app development, and our mission is to empower our clients with the ability to make the most of mobile apps and their website with the latest and greatest that technology has to offer. How many people can you reach with a mobile website? The best indicator is how many people actually browse the web on their mobile phones. As of late 2010, it’s currently over 36% of all U.S. mobile phone subscribers. 2.) Help bring awareness to your company via SEO/branding and web design/building through mobile solutions. 3.) Increase Web traffic and brand recognition. 5.) Provide platforms for Mass Email Marketing to consumers or investors of your product, service, or company prospectus.